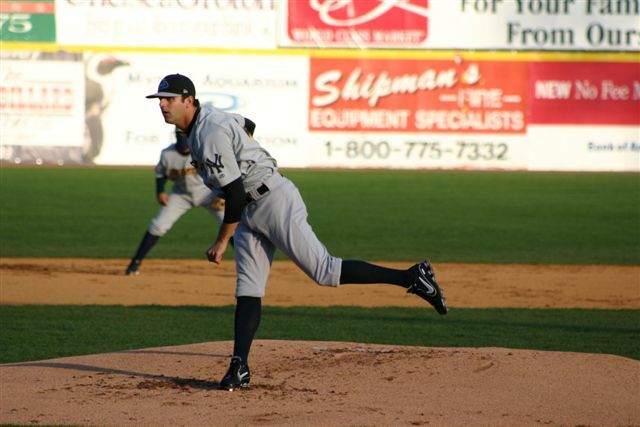 Pre-Game Notes: Chad Jennings reports that Thunder alum Sean Henn has been DFA’d. I agree with Chad in that I think someone will claim the former fireballer on waivers. It seems like the only way he loses this spot is when his inevitable call-up to Triple-A happens. Seven innings and 12 strikeouts in his last start? Yeah, that’ll make you number one. Curtis has been one of the more consistent Thunder position players, if not the most consistent. He has a 12-game hitting streak, and is third on the team in batting average with a .312 mark. Far from the most spectacular pitcher in the Yankees system, I’ll take the guy who gives me six or seven solid innings every start and gives my team a chance to win any day. Seems to be improving a little bit every time I see him. Has had some real good at-bats, and is looking like a baseball player instead of an athlete trying to learn one sport. Although he only has 41 at-bats, Russo leads the Thunder with a .341 batting average. His .974 OPS is also a team best. Has put together a string of really nice outings after a few bad ones to start the year. Has been swinging the bat really well lately. I don’t understand why Schmidt hasn’t been used a little more. He’s pitched well, but has only appeared in six of the team’s 26 games, making him the most infrequently used of the bunch. Wordy is starting to show that he, in fact, the same guy who showed up late last season and was simply dazzling. Rated more on reputation than the one good outing he had, Cox is likely to stay in Trenton for a little while before an inevitable call to Scranton. The bat has cooled off quite a bit for Pena. Looks Kontos is really starting to come around, as his ERA is now just a shade over three. The guy is frustrating to watch sometimes. He seems to always get ahead of hitters, then threaten to walk them. If you guys don’t send me any questions for Bo Hall, I may go the entire season without talking to the guy. Possibly the most anonymous guy on the team. Has been seeing some semi-regular playing time lately. Mendoza is respected in the clubhouse, especially after the way he handled being deactivated early in the season. Has recently shown flashes of what he can be, but he also got smacked around in his last home start and was lucky to get out of there with a no decision. Corona’s bat needs to come around, but he is tied for the team lead in stolen bases, and does draw a decent amount of walks. Just isn’t hitting right now. Simple as that. That’s right, dead last. I’m sure there are people more deserving of the spot if I was basing this solely on baseball, but earning a suspension combined with a poor start gets him the dreaded #24 spot. OFF THE BOARD: Steven Jackson, RP. Jackson was promoted to Triple-A Scranton. NEW ON THE BOARD: J.B. Cox, RP. 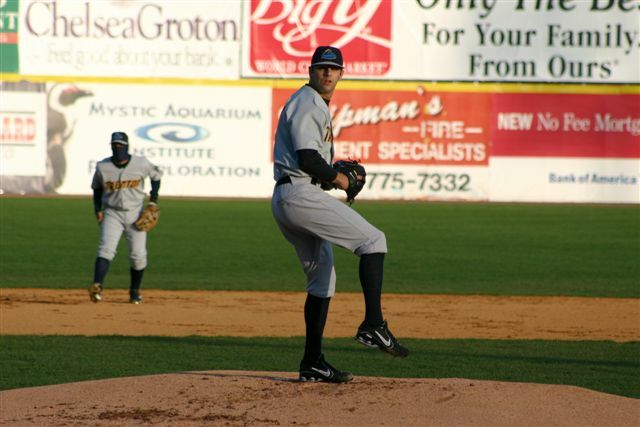 Cox, who last pitched in Trenton in 2006, returns after missing the 2007 season with Tommy John surgery. Courtesy of Greg’s Connecticut Defenders Blog, here are a few pictures of Thunder starter Chase Wright from tonight’s 4-1 win. Pre-Game Notes: Matt Carson has a 14-game hitting streak, while Colin Curtis has hit in 11 consecutive games. “Fab Five” Freddy Sanchez has the team record with a 27 game streak. Post-Game Notes: Matt Carson’s hitting streak ended, while Colin Curtis extended his. Cody Ehlers hit a two-run home run, while Chase Wright turned in seven solid innings. Jose Tabata…absent from the lineup. Whatever spin they’re trying to put on it, keep in mind Tony Franklin said that Tabata would be back in the lineup today, and that didn’t exactly happen. Hard to argue with the fact that — temper tantrum or not — he needed to be sat down for some time. Last week’s reader Q&A’s went well. Better than I thought they would, actually. I was hoping for a few more questions than I ultimately ended up receiving, but I thought it was a good way to let everyone interact with the guys. I will be in Trenton again starting Friday, and will be there after that on either Saturday or Sunday, potentially both. Post your questions in the comments section, and I’ll do my best to get them answered. Again, no promises that I’ll be able to get them all done, but I’ll do what I can. Have been able to confirm that Jose Tabata was suspended for this afternoon’s game. He is still with the team. It would hardly be surprising — considering the incident, his inability to hit consistently, and his admission that his hand still bothers him — for him to be sent down at some point. 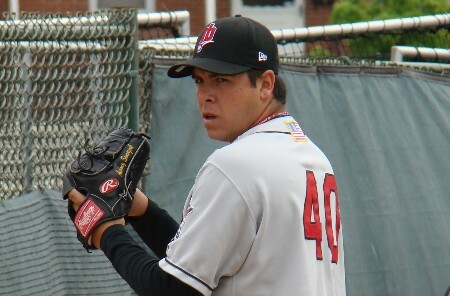 Anthony Swarzak came into the season as the Minnesota Twins 5th best prospect according to Baseball America. Thunder Thoughts: Baseball America has you ranked as the Minnesota Twins 5th best prospect this year. When you see something like that, does that mean anything to you? TT: With all the hype that’s surrounding you right now, is there any pressure that comes with that? TT: A few places have you projected as being a big leaguer as early as the end of this year. Is that kind of the goal you have as well, to get there by the end of this season? TT: How beneficial was your time in Double-A last year to your development this year? TT: Off the field, what kind of guy are you? NEWS: Several fans have e-mailed to say that after Jose Tabata’s seventh inning strikeout YESTERDAY, he got frustrated and slammed his bat down and simply left. We can’t see inside the dugout from the press box. One commenter reports he is serving a one-game suspension, but I have not been able to confirm this. Hopefully will have more on this later. Pre-Game Notes: The team travels to Connecticut for a three-game series that starts Tuesday — they’re off tomorrow — and then return home to play Portland starting Friday. Which would mean Phil Coke pitches against Portland on 5/2, followed by Jason Jones on 5/3 and then Wright again on 5/4. Portland will tentatively send Michael Bowden to the mound on 5/2, then Kris Johnson 5/3 and Dustin Richardson on 5/4. All big prospects for them. Can’t wait. Colin Curtis carries an 11-game hitting streak into the game, while Matt Carson’s streak is now at 13. Post-Game Notes: Kevin Russo and Matt Carson were both one hit away from the cycle. Russo scored four runs, and Carson drove in five. 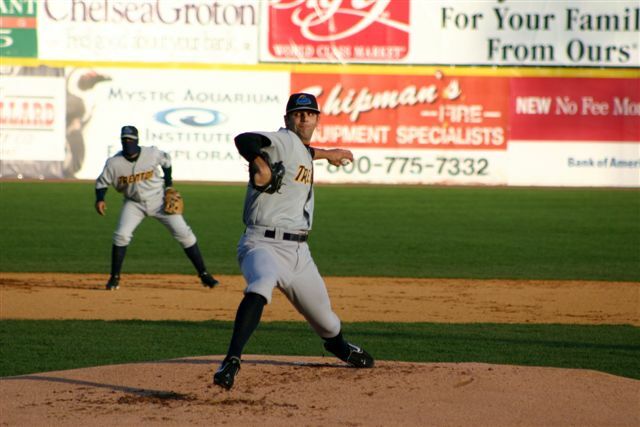 J.B. Cox made his first Thunder appearance since September, 2006 and gave up two hits while striking out one in two innings. Thunder Thoughts: The Justin Masterson YouTube video I posted just last week has already accumulated over 3,000 views. Odd. As I’ve mentioned several times previously, the Thunder will be hosting their annual Autism Awareness Day today. Thunder Thoughts will be making a small (see: all I can afford) donation for every home run hit by a Thunder batter today. For information on how to make a donation as well, please contact me at mashmore98 AT gmail.com and we’ll figure something out. I’m sure there’s a more professional headline than that, but seriously…check out David Robertson’s dirty, nasty, falls off the table curveball.